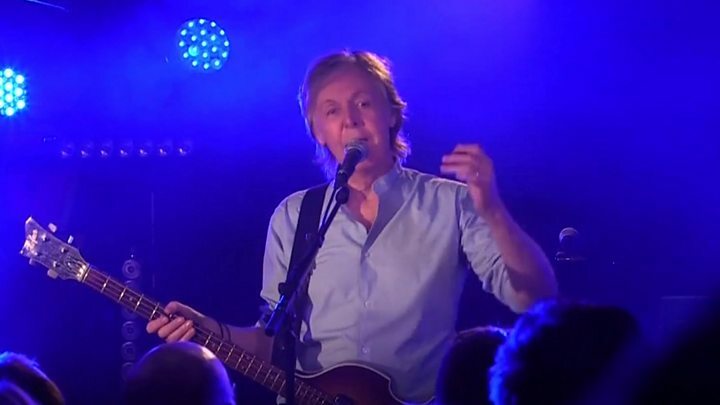 More than six decades have passed since Sir Paul McCartney first performed at the Cavern Club, but the Beatles legend returned to roll back the years at a "secret" gig there on Thursday. Around 250 people crammed into a sweaty Cavern to hear the 28-song set. "Coming back here is pretty amazing for me," the 76-year-old told the crowd. He skirted over the fact that the original Cavern was filled with rubble in 1973 and the venue for Thursday's show was a more modern live room attached to a replica Cavern that was built nearby. "Imagine this for me - all these years ago when we played the Cavern we didn't know if we'd have any future," he said. "But we did OK."
The crowd included 175 lucky fans who had to race to collect the free tickets from the Echo Arena box office when the show was announced on Thursday morning. Tom Gilchrist, 28, from Liverpool, started waiting outside the Cavern first thing after hearing rumours of the gig. But they jumped in a taxi when they heard they had to get to the arena. They joined others running to the box office, and saw one woman faint in the process. "It was like Beatlemania all over again," he said. Friend Chris Clements described the concert as "probably the best thing that's ever happened to me in my life". He said: "We were so close he could have been in my lounge at home." His girlfriend Dana Fischetti, 22, happened to be visiting from Connecticut, USA. "I'm so lucky," she said. "The chances of this happening are so long. It doesn't feel real that this is really happening. I love The Beatles." Sir Paul greeted the crowd by adapting the lyrics from the song Michelle: "Liverpool! Cavern! These are words that go together well." After an introductory jam, he launched into "the song that got me in The Beatles" - Eddie Cochrane's Twenty Flight Rock, which Sir Paul played as his audition for John Lennon in 1957. "I think you've all been told not to take photos," he said. "And you're taking them, and you're taking them, and I don't want to get put off, and you're putting me off." One fan was ejected for filming during the opening jam, even before Sir Paul had made his plea. Smartphones weren't an issue when The Beatles played at the original Cavern almost 300 times between 1961-63. Since then, Sir Paul has only played at the current Cavern once, in 1999. On Thursday, he said returning to the venue had given him "flashbacks to the early days". He paid tribute to late bandmates John Lennon and George Harrison, and his set included In Spite of All the Danger, written and recorded when the group were still The Quarrymen. There were also Beatles and Wings hits like Magical Mystery Tour and Band on the Run, as well as several tracks from his forthcoming solo album Egypt Station. If this gig and those songs are anything to go by, he's keen to show he's still full of vim, vigour and virility. Come On To Me, with its chorus "If you come on to me, well I'll come on to you", sounds like an attempt to suggest he'd still be casually courting, if he wasn't happily married. He told the crowd the lyrics of another new one, titled Fuh You, are "open to interpretation" - when in fact they convey even more buccaneering machismo. "He's still got it," said one concertgoer, James Jardine, from Liverpool. He added: "To get so close to someone who's so famous and iconic is unbelievable. You feel you could reach out and touch him." Hundreds more weren't so lucky and had to make do with listening to a busker playing The Beatles' hits as they waited outside for a glimpse of the rock legend. The Cavern Club concert comes weeks after he played a surprise show for about 50 fans at the city's Philharmonic pub for James Corden's TV show. On Monday, he also performed at Abbey Road Studios - where The Beatles famously recorded - watched by stars including Kylie Minogue, Johnny Depp and Stormzy.